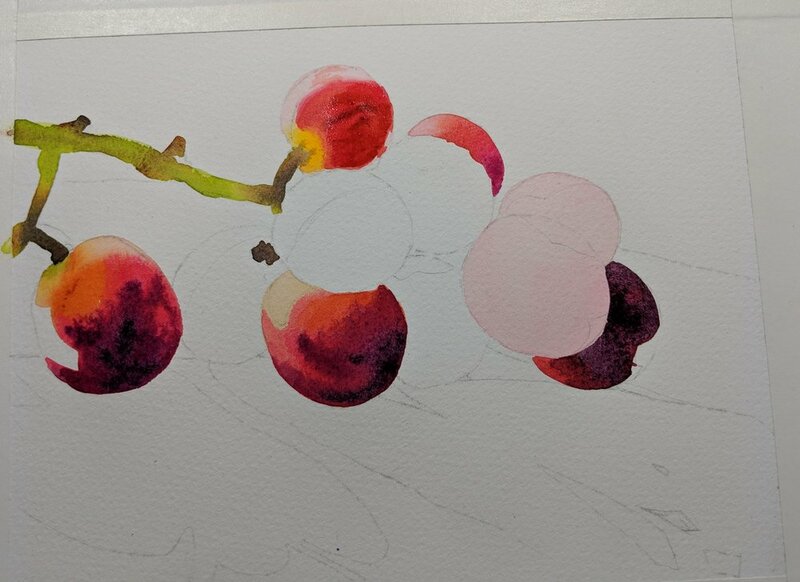 Here’s a step by step lesson on painting a bunch of grapes from a reference photo. First, make sure you photograph your subject in bright, dramatic lighting. Long shadows and transparent grapes are exciting to paint. Print out a full size color photo on good photo paper. I always add a little black and white image too so I can ‘see’ the values accurately. Trace the image onto tracing paper and then blacken the back of the tracing paper with graphite. 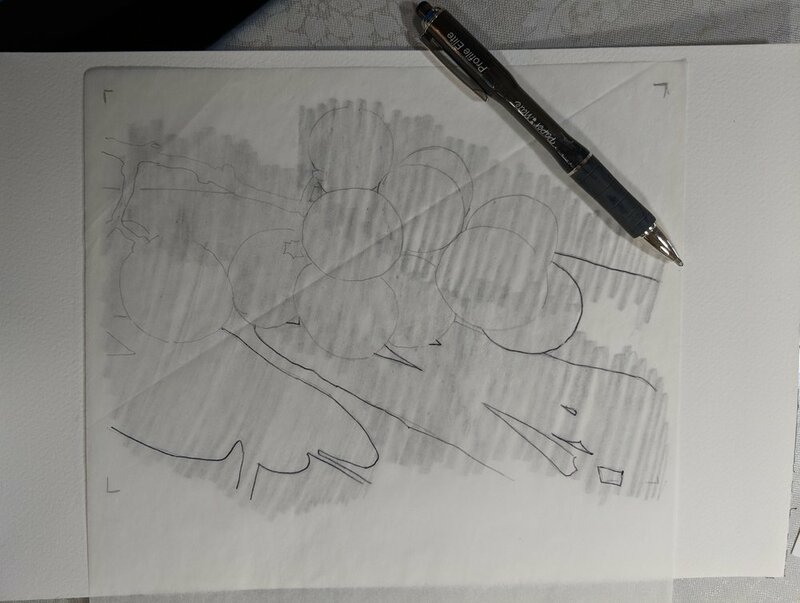 Tape the tracing paper to your watercolor paper (graphite side down) and using a ballpoint pen transfer the drawing to the watercolor paper. Tape around the image to ensure nice clean edges when the painting is complete. Use only white or pale beige masking tape - colored tape can affect your ability to judge color accurately. 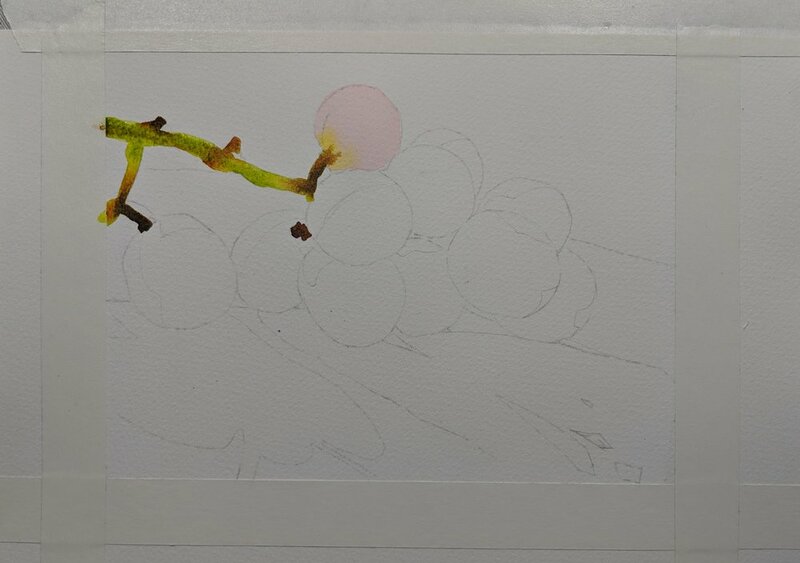 Begin painting the elements such as stems and grapes. We will paint the background and shadows last. 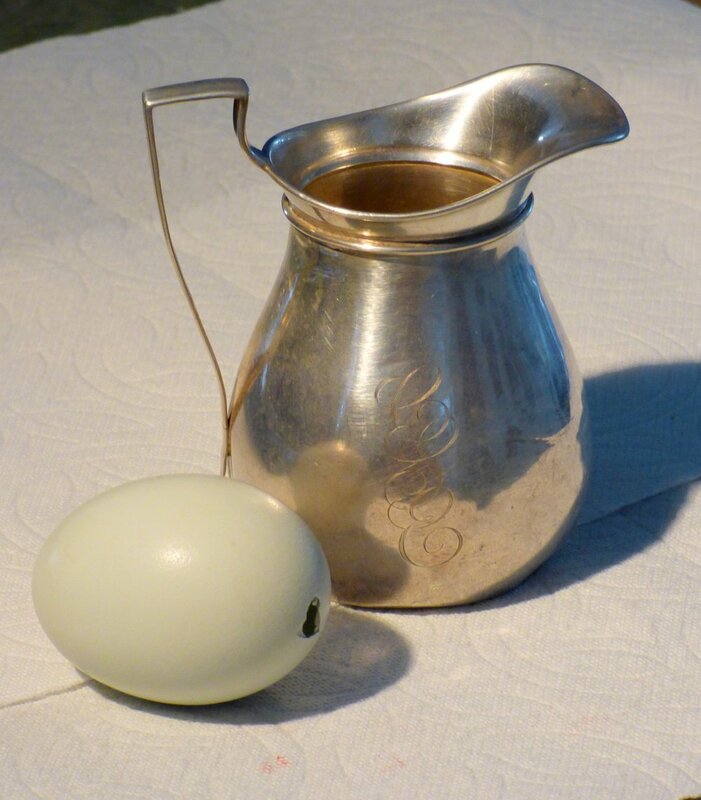 Drop in dark colors while a grape shape is wet, also soften edges as needed while the shape is wet. 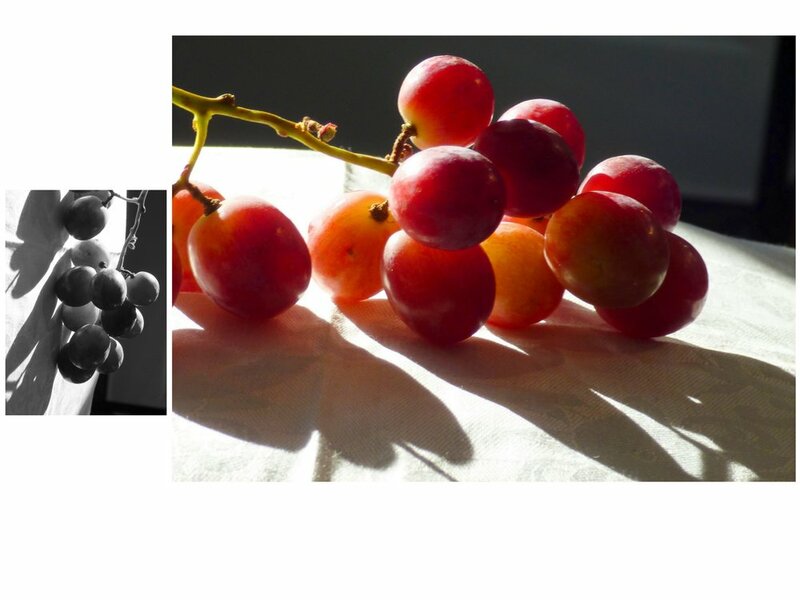 continue painting one grape at a time, remembering to paint around reflective light shapes as seen on the furthest left grape. As I continue to work with oil paints I find that using large brushes and a small canvas forces me to be more impressionistic which is what I am striving for. Using lots of turpentine and transparent red oxide I block in the value shapes. 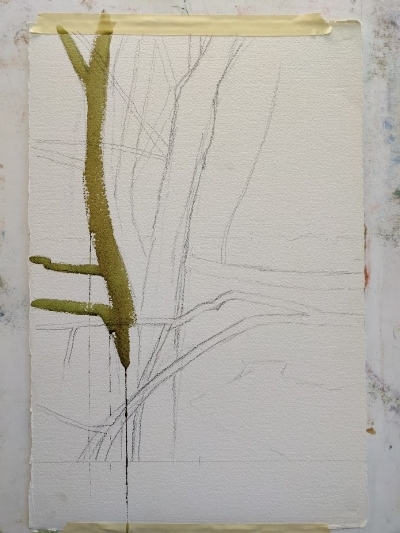 Working from dark to light I block in colors following the value scheme. Working on the stone barn which is my center of interest. Suggesting buildings in the distance. Last details added to the trees in the mid-ground. I may glaze over the distant stone buildings later to soften edges and cool the colors so they will recede into the distance. Many years ago I took photos of the lily pads at our local Sequim pond. 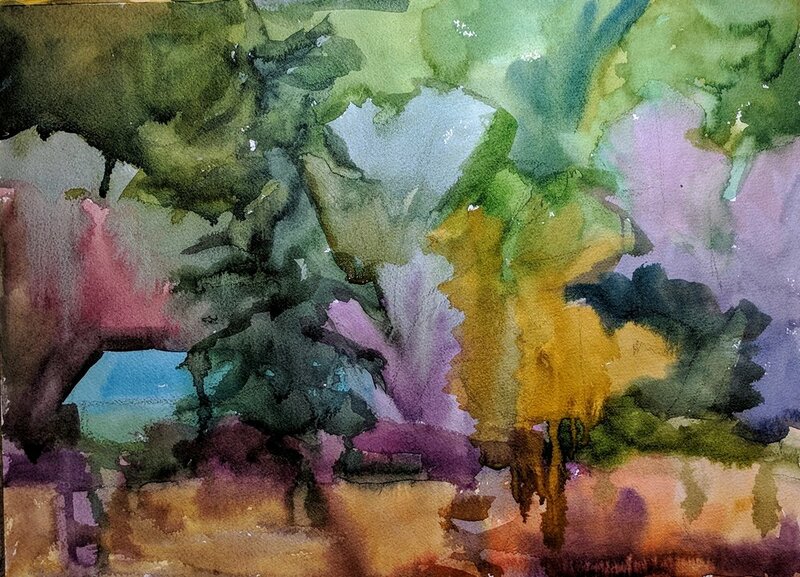 I have tried painting this scene several times over the years and just could not create the painting I wanted. Finally I realized I needed to take a smaller bite and crop the reference image until it had just a few major dark and light shapes. I cut 1/4" foam core and 400 grit UART paper to the size of an existing frame. I mounted the UART sanded paper to the board, drew in the rough lily shapes with charcoal and then slathered on dark neutralized watercolors. 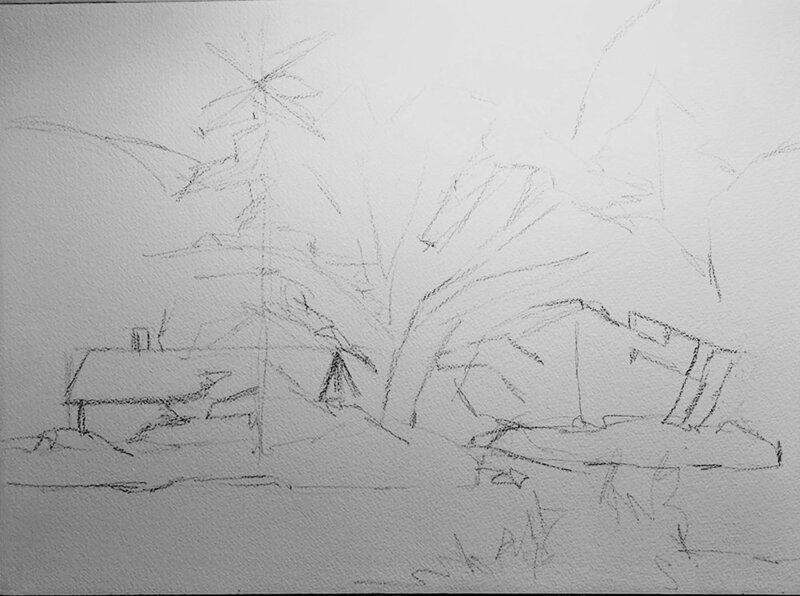 A quick value sketch just 2" x 3" to check the design. 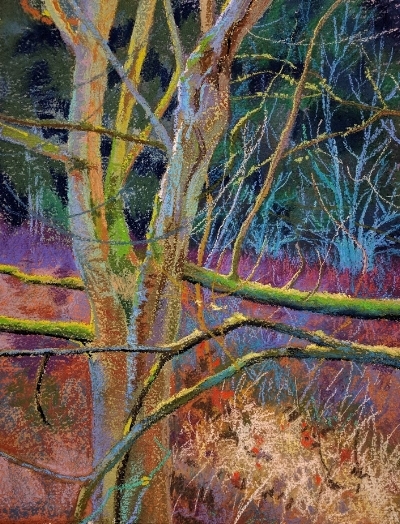 Another example of pastel over watercolor; a pencil sketch on 300# Arches watercolor paper. Dark, neutralized watercolor passes. I lay in the darkest values I see in each shape. Here I lay in the medium pastel values I see in each major shape. Finally I lay in the lightest value details with pastels. Like every medium, oil painting has its own difficulties and rewards.